Today started with a bit of a pullback as the details of the ECB lending program were shared with the public. The morning was spent in a mild pullback (the techs were a little more bearish as ORCL and other semiconductors had a tough time) before the buyers showed back up after lunch and slowly pushed the indexes back up to the flat line (except for the tech indexes which closed down). Following yesterday's very bullish day the bulls can certainly be happy nothing was given back. Yesterday's rally was brought to us courtesy of the ECB (with the backing of the Federal Reserve's swap agreement) and their giveaways, I mean free loans, I mean low-rate (1%) loans. European banks hungrily gobbled up the money so that they could make money by lending it out at anything above 1%. I'd love to borrow at 1% and buy some Treasuries at 2% and make on my borrowed money. If the European banks use the money to buy bonds paying 4%-7% they'll do quite well (as long as the banks can get their principal back). I'd then pay myself a huge bonus at the end of the year for being a financial genius. There were 523 banks who asked for a handout yesterday, borrowing 489 billion euros ($645B), which was considerably more than the 293 billion euros ($386B) that most had expected. I'm surprised more banks didn't borrow or maybe they all did. Lending to the banks who then bought sovereign debt, dropping government yields, has many hoping that the sovereign debt issue has now been resolved. That may be a little wishful thinking, something the stock market is good at. While the ECB scheme could certainly help decrease the cost for governments to pay their debt, ultimately it's a question of whether or not the governments can pay their debt, regardless of how cheap that debt is. And today registered a little more concern in that regard, as I'll show in a bit. The ECB is hoping the banks borrowing the money will use it to continue purchasing government debt, which is their back-door method of doing what the Fed is doing directly with its QE programs. Now all the central banks are essentially lending money to the banks and taking just about any kind of collateral, including Greek bonds (wink), in return. The global bank are becoming even more joined at the hip and will either survive through this together or they will fail collectively and miserably. Right now the stock market is betting on survival, but then the stock market could be accused of being forever hopeful. One problem is that the ECB can't demand the banks purchase government debt with their newly found money. The banks could lend it out for other purposes or hold onto it and pay off their own maturing debt with the cheaper money, which would be a net zero as far as adding liquidity to the system (the current bank debt merely being replaced by the new and cheaper debt). This is one reason why the current ECB trick is creating some liquidity right now but could be removed over the next few months as about 230 billion euros of bank bonds mature in the first quarter of 2012. Even the head of the ECB, Mario Draghi, said "Banks represent about 80% of lending to the euro area and the banking channel is crucial to the supply of credit." This point is important and a reason to keep an eye on interbank lending rates. Draghi predicted banks will experience "very significant funding constraints" for the "whole" of 2012. Banks in the euro area need to refinance 35% more debt in 2012 than they did in 2011, totaling about 600 billion euros. Suddenly the 489 billion euros borrowed yesterday sounds like only a down payment. On top of all that bank debt there is still the massive government debt to buy. All of this sounds sobering, but it didn't spook stock market bulls who have an agenda for the rest of this month. The ECB is trying to reduce fears in the banking community by making more and cheaper money available. Most economists agree that this latest action by the ECB, while helpful to the banks to reduce their costs and improve profitability (which is after all the central banks' main concern), it does not address the fundamental problem of too much government debt that continues to climb higher. And fear by the bankers is not helping relieve the liquidity between banks, which can be measured by the interbank lending rate. After yesterday's initial gleeful reaction, today saw sovereign spreads widen again. There was a minor drop in the Italian 10-year yield on Tuesday but it was reversed today, closing near 6.8%. 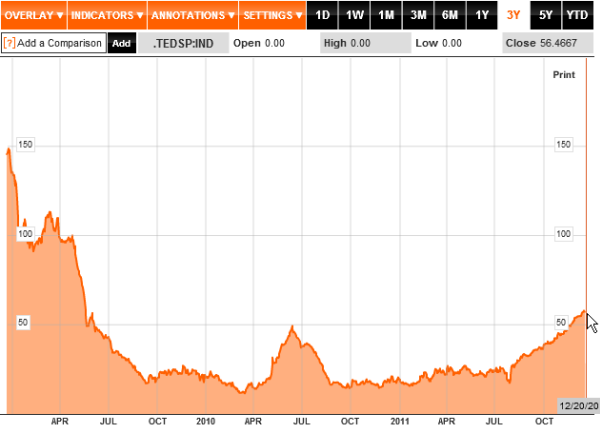 There seems to be just enough support coming in for Italian bonds to keep the yield below the dreaded 7%. But it's reflective of the worry about the debt, which is not something that can be solved by giving the banks more money. Spreads between European countries' bond yields and Germany's bond yields widened again today. And the TED spread (the difference between interest rates on interbank loan -- the 3-month LIBOR (London Interbank Offered Rate) -- and 3-month T-Bills) widened again today and is now at its highest level since May 2009 when the spread was dropping sharply from its October 2008 high. The relentless climb in the TED spread since August is worrisome and it reflects fears among the banks who are demanding higher rates before they'll lend each other money. That's indicative of a credit problem that not even the central banks can relieve. It comes from distrust and as credit becomes harder and harder to get it will be reflected in a weakening economy and stock market. Enjoy the stock market's gains while they last because I don't think it will last much longer. A rally into year-end will be your best opportunity to get out of stocks and get defensive. And if Monday's lows are broken you'll want to get out sooner rather than later. At Monday's low SPX hit its 20-week MA at 1202.44 (the low was 1202.37) and another good day or two it could test its 50-week at 1267.88, which is where last week's rally stopped. So it's a battle between the MAs at the moment. And if Santa's little helpers can bring good cheer to the bulls through Christmas we could see SPX back up to its broken H&S neckline near 1300 next week. As I'll get into, that would make an excellent finish to the bounce pattern off the October low and an outstanding shorting opportunity. The risk remains to the downside but hopefully we'll get the rally into next week to set up a longer-term shorting opportunity. I for one am tired of the jerking up and down and would like to get a nice trade that I can hang onto for more than a day. 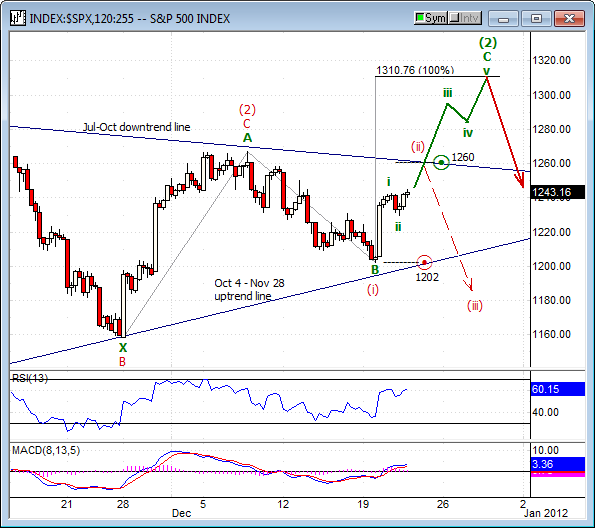 As shown on the daily chart below, two equal legs up from November 25th would have SPX up to 1310.77, which is only slightly above the broken H&S neckline. It would also have SPX tagging its 78.6% retracement of the May-October decline, something I thought it was going to do back at the end of October. This has been a common retracement level for 2nd wave corrections in this market (deeper than normal), which the bounce off the October low is labeled (the May-October decline was the 1st wave of the new bear market). Today SPX found support at its 50-dma at 1231.66 and the next resistance level is 1258-1260. That's where it will run into it downtrend line from July-October, its 200-dma and its 62% retracement of the May-October decline. That's why it would be even more bullish above 1260 -- the remaining shorts will scream like little girls (is that sexist?) as they run for cover. The bulls need to rally tomorrow otherwise today's hanging man doji could be considered a bearish reversal setting up. It's also a little worrisome that MACD hasn't been able to climb above the zero line yet. Sticking with the daily chart above, if you look at the rally off the November 25th low you'll see the big white candle on the 28th followed by a day of consolidation on the 29th and then the even bigger white candle on the 30th. Bulls would love to see that kind of move again. I'm not sure what the central banks could do for an encore here but anything is possible. So on the chart below I'm showing how a very bullish run up to 1310 would look, getting to that level by next Wednesday the 28th. Why that date? It's a major turn date on the Bradley Model. 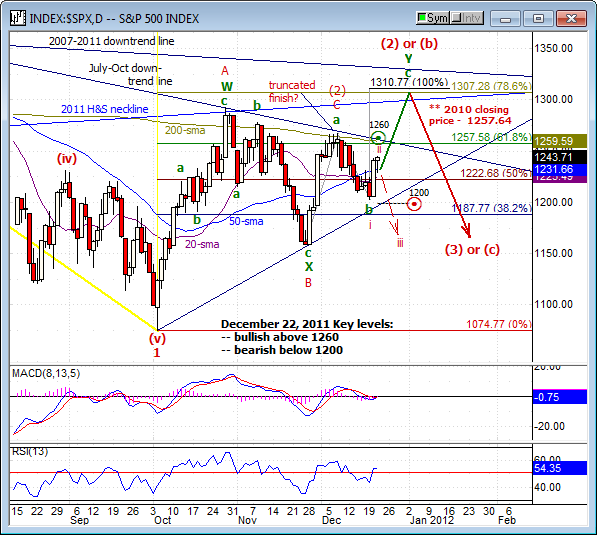 Otherwise there's another important cycle (and Gann) turn date on January 2nd, just 3 trading days later. If the downtrend line from July (and 200-dma and 62% retracement) hold near 1260, it's possible it will complete a 3-wave correction to the December decline and start the next leg down from there. That bearish wave count would not become clearer until we saw an impulsive decline and especially with a break below 1200. The DOW has a very similar setup as shown for SPX. Two equal legs up from November 25th would have the DOW rallying up to 12761, which would be about 115 points from its May high. Color me doubtful about that happening but it's certainly a possibility. If it can get through 12400 I see upside targets at 12500 and 12620, the downtrend lines from May and 2007, respectively. 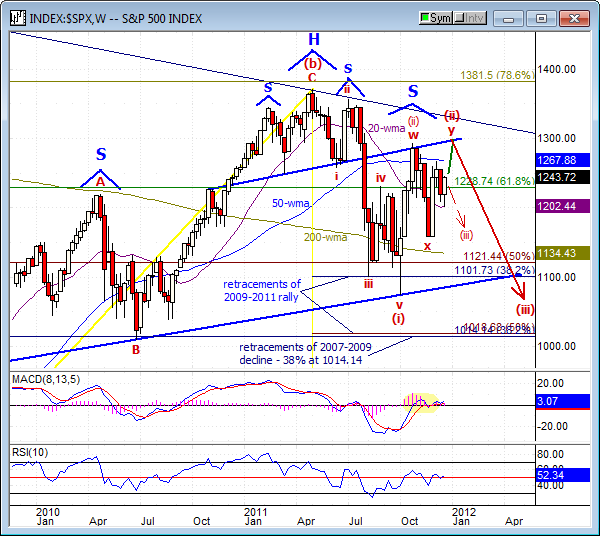 The lower target is also where the broken H&S neckline is located at the end of the month. Any failure below its December 7th high near 12258 followed by a drop below Monday's low at 11735 would likely lead to a strong selloff. 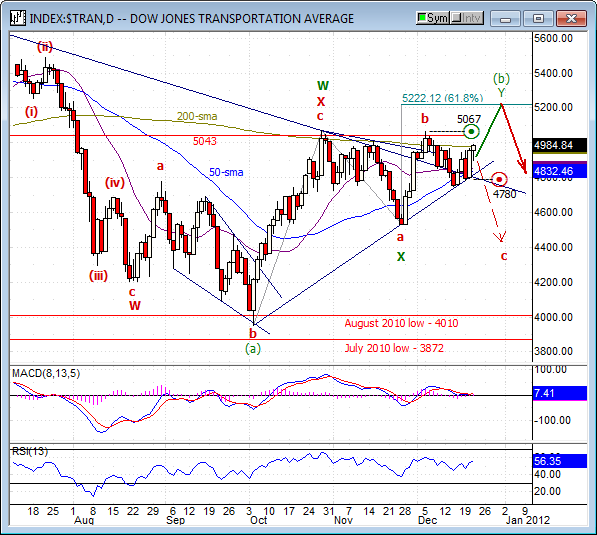 For both SPX and the DOW there might not be quite as much as bullish potential as I've shown on their charts. The wave count for the move up from October 4th is a double zigzag, which means two a-b-c legs to the upside that are separated by an a-b-c pullback (wave-x, which is the November pullback). The first a-b-c leg is the October rally and the second a-b-c move up is the rally from November 25, which needs the c-wave to complete (with a new high as depicted on their charts). The two a-b-c legs up are often related to each other in size and the 2nd leg up (from November 25th) would be 62% of the 1st leg up at SPX 1293 (keep that number noted on your charts in case it's hit and price reverses back down from there). 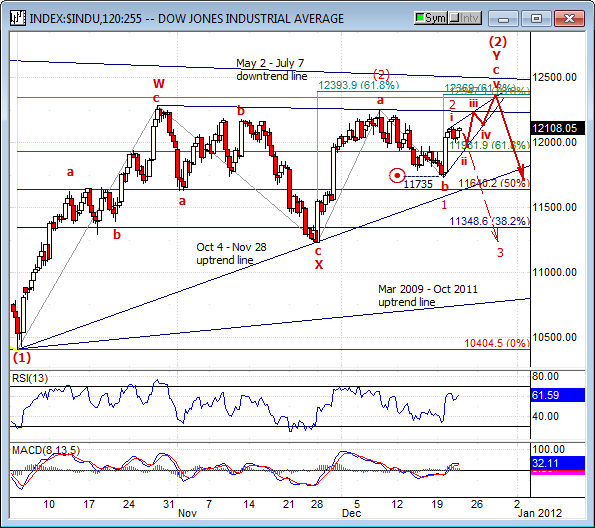 For the DOW that projection is at 12393.90, which is shown on the 120-min chart below. Still referring to the chart above, the a-b-c move up from November 25th would have the c-wave equal to 62% of the a-wave at 12369. The 78.6% retracement of the May-October decline is at 12347 (hard to see with the latter two Fibs practically on top of each other). This makes the 12347-12394 area a potentially strong area of Fib resistance. And then 100 points higher is the downtrend line from May. I'm thinking the DOW will not make it through this area and that the bounce off the October low will end there (assuming it makes it there). It's the area I'll be watching for failure and then get into a significant short position. BTW, the ending diagonal (rising wedge) idea is just something I'm considering and watching for over the next few trading days. It would be a typical ending pattern and would add to my confidence about an end to the rally. Notice that it would finish with a quick throw-over above the downtrend line from October 27th, stopping out shorts and sucking in more longs, followed by a reversal right back down, leaving a bull trap and frustrated bears. We'll see how it sets up in the next week and hopefully by next Wednesday we'll be closer to a setup that I can help you take advantage of. The techs have more of a mixed message today after their negative day. Yesterday's rally failed short of its 200-dma near 2288 and today it closed back below its 20-dma near 2262. If the market is going to break down instead of rally, it will be the techs leading the way and a break below 2209 would be our canary. Otherwise if it gets into gear to the upside there's Fib and trend line resistance near 2400. The RUT could be the first above its December 5th high at 752.71 as fund managers jump into the small caps, hoping for some outsize performance to the upside. That makes it vulnerable to hard selling if the market reverses back down and a break below 700 would likely be followed with a quick decline. In the meantime, if the bulls continue to drive the market higher into next week and the RUT can get above trendline resistance near 740-745, it should have no trouble getting up to its 200-dma near 764 and above that it should head for 792 for two equal legs up from November 25th. 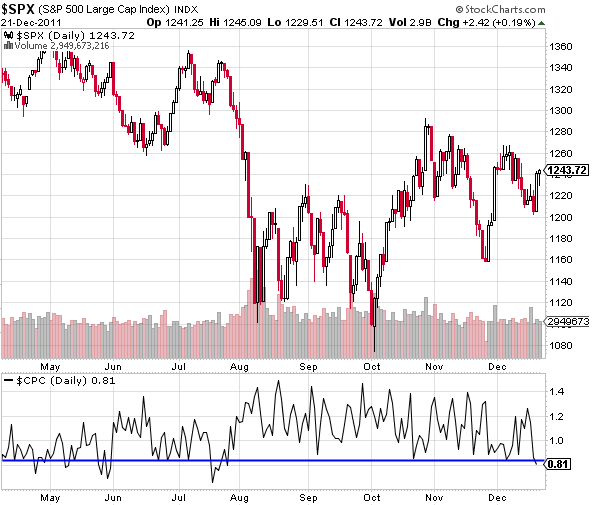 There's been very little fear in this market since December 8th, the last high for SPX. Even as the market pulled back the VIX continued to drop, which was odd behavior. There was a lot of call buying and/or put selling as traders were convinced in the year-end rally scenario. That's a little worrisome -- no fear and no wall of worry to climb. But as long as the call buying continues it keeps up the bullish pressure on the market so it's bullish until it's not. The risk is that it could violently snap back, exacerbating any selloff in the market. 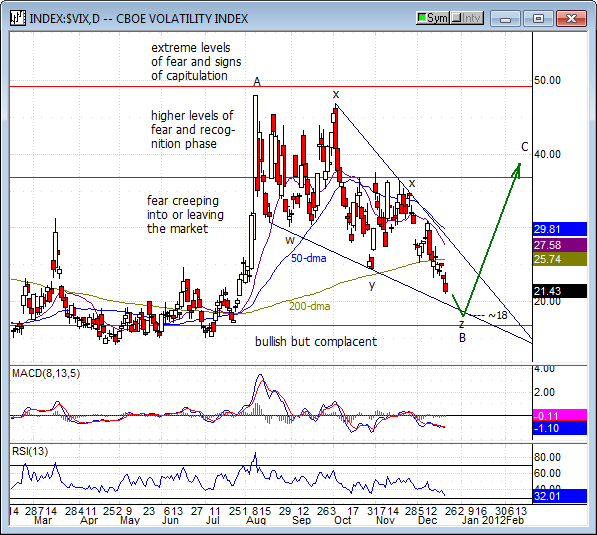 The VIX looks to be close to finishing a bullish descending wedge pattern and a drop to the 18 area next week, presumably with new highs for the stock market would add credence to the idea that we should be looking for a major reversal after that. Another sign of heavy call buying/put selling is the put/call ratio. The ratio is approaching 0.8 which as you can see with the chart below has been a level associated with previous market highs. It closed at 0.81 today and it's been lower back in April, May and July (also market tops) but the last few times it's approached 0.8 we've seen market highs. For now it's simply a warning. Supporting the stock market's rally the past two days is the bond market which has seen some selling (risk-on trade is back). 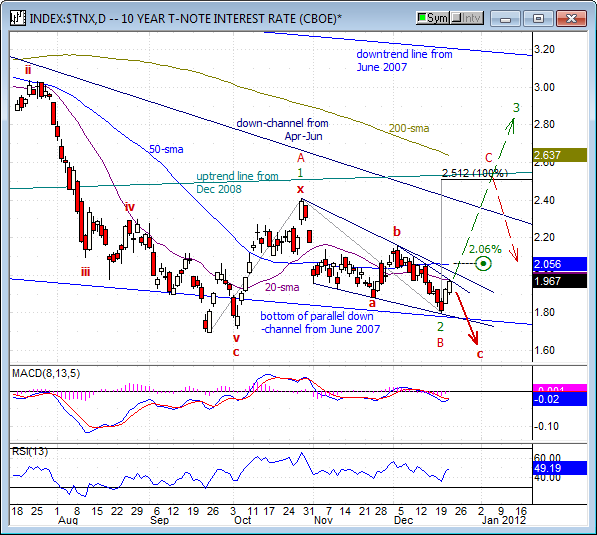 If TNX can rally higher tomorrow it will break its short-term downtrend line from December 2nd and its 20-dma, both at 1.979%, which is where it stopped today. A little higher is its downtrend line from October 27th, near 2.02% and then its 50-dma at 2.056%. A rally above 2.06% would be bullish (bearish for bond prices) for a run potentially up to a price projection near 2.5%, which would also be bullish for the stock market. For now I don't think TNX will make it above 2.06%. U.S. Treasuries could see more buying, thereby driving yields back down, if fear comes back to the European bond market. A rise in European bond yields and the TED spread would be another sign that the Fed/ECB effort to simply flood the banking system with cheaper money is not going to fix the problem. That's why it's important to keep an eye on these spreads and European bond yields, especially if money runs back into U.S Treasuries, driving TNX lower. The stock market follows TNX. Of the two bank indexes that I follow, BIX and BKX, BIX is stronger. While BIX is close to testing its December 7th high, and broke its shallow downtrend line from October 27th, BKX remains relatively lower and has not yet broken its steeper downtrend line. So I'm watching BIX for upside targets, which first is its 200-dma at 129.50. 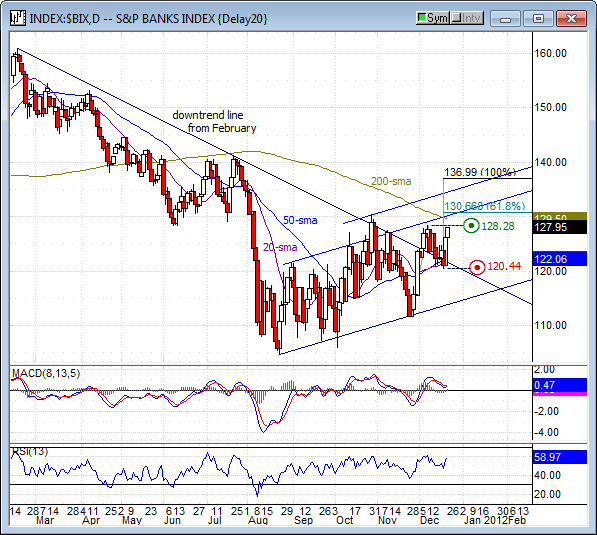 Only slightly higher is the top of a parallel up-channel, near 130.20 tomorrow. And then just above that is the 62% projection for the 2nd leg of the bounce off its November 23rd low. If the banks get a lot of lovin' in the next week, two equal legs up from November 23rd is at 136.99. Follow the banks (money). The pullback in the transports in December had the TRAN testing and holding its uptrend line from October 4th, which is bullish as it tested and held on the 14th and again on Monday. It also means a break of its uptrend line, near 4830 and its 20 and 50-dma's, would be a sell signal. Today's rally closed marginally above its 200-dma at 4976 and has upside potential to a Fib projection at 5222 by the end of the month. The stock market and U.S. dollar continue to act inversely and sometimes it's hard to figure out which one is the dog and which is the tail. The currency is the much bigger market and I think the stock and commodity markets are reacting the euro/dollar rather than the other way around. So watching the dollar continues to provide important clues. This afternoon the dollar started back up after pulling back from a midday high. The stock market also pushed back up to its highs and that was a divergence from normal behavior. It's simply a warning that stocks might reverse back down tomorrow. 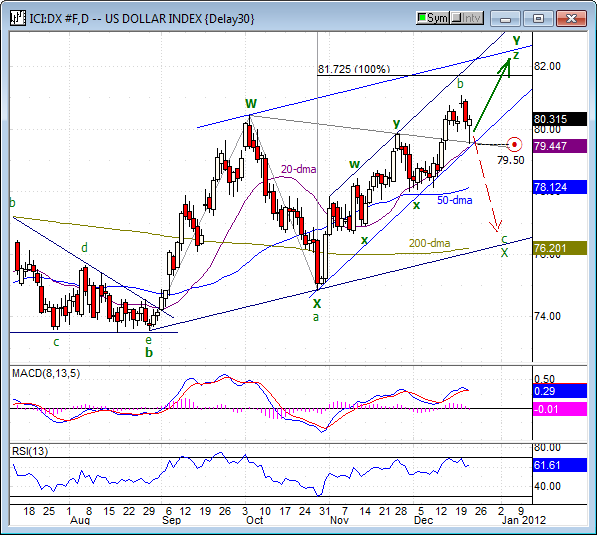 During the overnight session the dollar had dropped to support near 79.50 (broken downtrend line from October 4th) and the bullish wave count calls for a continuation higher. If the stock market rallies higher with it, I will become even more suspect about the gains made in the stock market the closer we get to the end of the month/year. If the dollar drops below 79.50, which should lead to at least a larger pullback for the dollar, it would be bullish for the stock and commodity markets. Gold is finding resistance at its broken uptrend line from January-September and I expect to drop to a minor new low before consolidating once again and then lower. 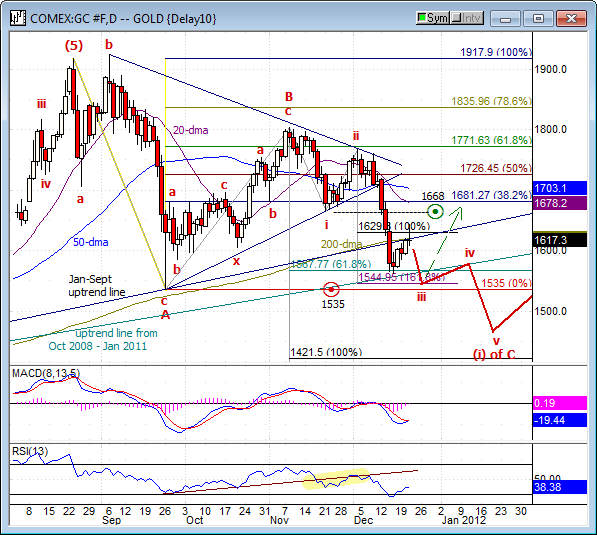 It takes a rally above 1668 to at least negate the bearish wave count. Oil got a big bounce with the stock market and both could continue higher into next week. That could have oil back up for a retest of its November 17th high at 103.37 and another test of its broken uptrend line from February 2009. 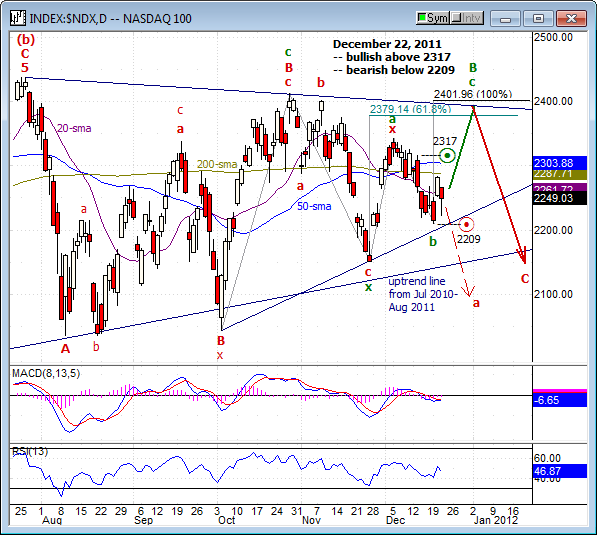 Otherwise the high bounce could lead an even stronger decline in a 3rd of a 3rd wave down. A break below its 50-dma near 95 would be a bearish heads up. 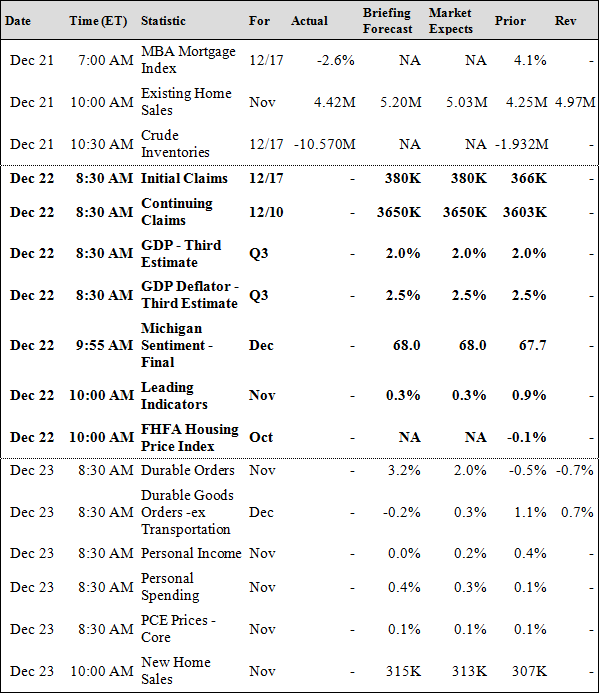 Tomorrow we'll get the final Michigan Consumer Sentiment number but there should be no surprises. It's doubtful we'll see any market moving reports. I've outlined upside targets for the indexes and we've got a good setup for a rally into next week to finish the bounce pattern off the October 4th low. The bounce pattern is a correction to the May-October decline, which is the important part to remember. Once the correction finishes, we'll be due a stronger decline than what we saw this year (3rd wave). 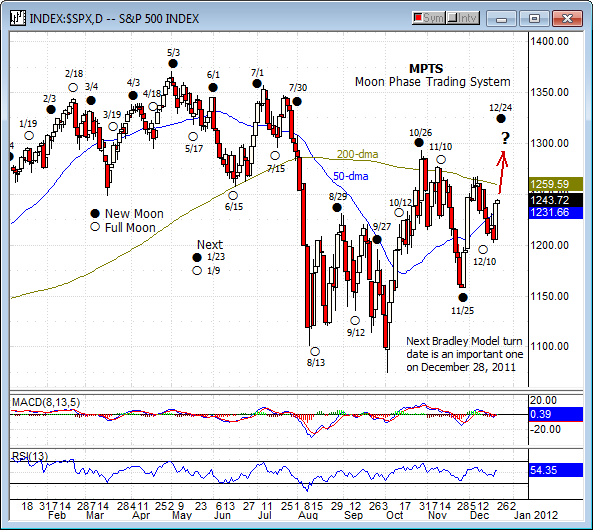 That would mean a fun time for bears in the 1st quarter of 2012 but a bad time for the bulls. Considering the downside risk I'm strongly recommending getting out of long positions by the end of the year. If Monday's lows are broken you should get out sooner. 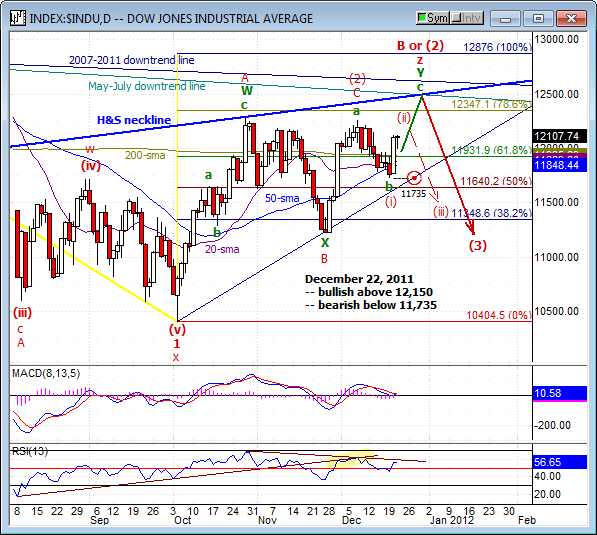 In addition to the upside targets, such as DOW 12400-12500, there are some potential turn dates to mark on your charts. First up is the MPTS chart showing the next new moon on December 24th. Say what you will about how silly it is to use the moon for turn dates but you can't argue with the black circles (new moons) at all those highs this year. The next date is December 28th. This is an important turn date on the Bradley Model, which is the date I've used on my charts for a market high. 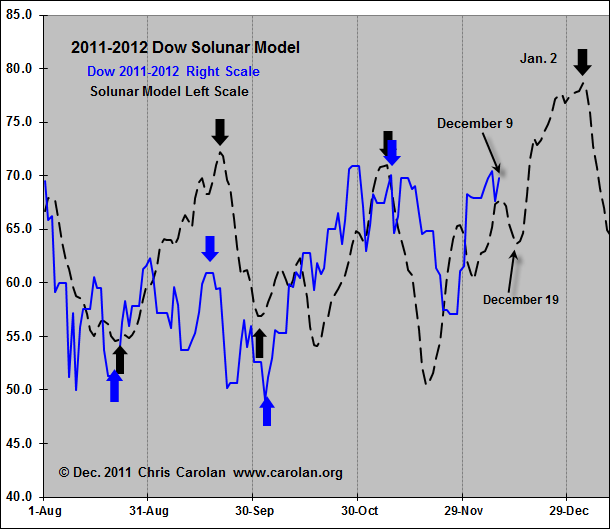 The next turn date is based on the Solunar Model that Chris Carolan has been referencing in his newsletter. The chart that I have from him was last updated on December 9th, which called for a pullback into mid month and then a rally to a new high on January 2nd. So far the DOW is following the model. Adding to the strength of a January 2nd turn date is the Gann Square of Nine chart that shows January 2nd is 90 degrees from the October 4th low. On the Gann Sof9 chart 90 degrees is most often associated with completion of corrections. So we've got some upside price targets and potential turn dates to keep an eye on, especially if time and price marry up. But keep in mind that until the December highs are exceeded, we could be getting just a high bounce correction to the December decline. If the market turns back down it could accelerate lower quickly. Take a break below Monday's lows seriously -- it would be time to bail out of your long positions and get short. Good luck and I'll be back with you next Wednesday. Happy Hanukkah and Merry Christmas to all. May Santa bring you something better than a lump of coal. Have a joyous time with your family and blessings to each and every one of you as we finish up this difficult year. The Free Silver Dollar bonus with the End of Year Special went over so well over the Black Friday weekend we are bringing it back. EVERY end of year subscriber will receive a FREE U.S. SILVER DOLLAR! 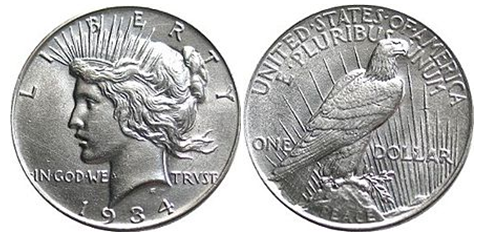 One free Morgan or Peace dollar with each End-of-Year Special subscription! These U.S. silver dollars were minted between 1878-1935 and consist of 90% silver, roughly eight tenths of an ounce of silver. With the price of silver hovering around $30 these are worth collecting and make great gifts for grandkids! FREE SILVER DOLLAR WITH EOY SUBSCRIPTION! Have You Renewed Yet? Time Is Growing Short! Every December we offer the best prices of the year on a renewal package of our top newsletters. If you have been a subscriber for several years you know this is the best price and the best deal of the year. 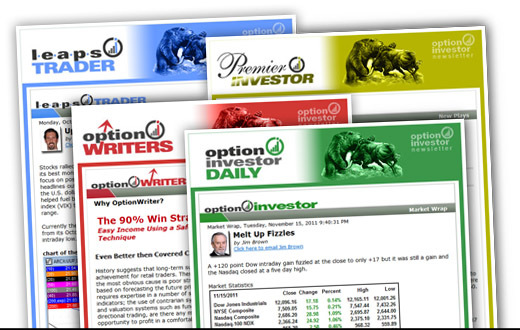 This year we are offering Option Investor, Premier Investor, Leap Trader, Option Writer and our new newsletter starting in January, Ultimate Investor. Please follow the link below to see for yourself the EOY subscription special for 2011. You will not be disappointed! ANDE is in the farm products industry (think grains and ethanol). The stock has been stair-stepping higher off its 2011 lows. Now the stock is poised to breakout past resistance near $45.00. I am suggesting we open small bullish positions with a trigger at $45.25 and a stop at $42.45. If triggered our target is $49.75. FYI: The Point & Figure chart for ANDE is bullish with a $74 target. Analysts are bullish on the discount retailers like TJX as consumers look for the best deals this holiday season. The stock is just starting to breakout from a two-week consolidation. 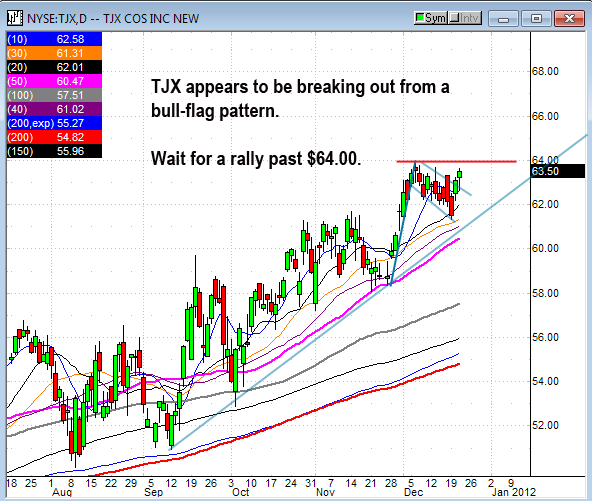 TJX might benefit from a little end of the month window dressing too. We want to see a little more confirmation. There appears to be resistance at $64.00. I am suggesting a trigger to open small bullish positions at $64.10 with a stop loss at $61.90. TJX doesn't move super fast so we'll need some patience. Our target is $68.00. FYI: The Point & Figure chart for TJX is bullish with a $78 target. The U.S. markets faded lower this morning but reversed higher with an afternoon rebound. Our BMC put play was triggered today. 12/21 update: The rally continues and BA confirms the breakout from its two-week trading range. The next hurdle for the bulls is potential resistance near $75.00. More conservative traders might want to up their stop loss. There is potential resistance at $75.00 and more conservative traders may want to exit there. I am aiming for $77.00. FYI: The Point & Figure chart for BA is bullish with a $79 target. 12/12/11 trade did not open, try again. 12/21 update: Whew! Our play was almost triggered this morning. HITK opened higher but the S&P 500 actually opened lower before turning around this afternoon. HITK's rally attempt faded and the stock underperformed today with a -2.6% drop. I couldn't find any news to account for HITK's underperformance today. We will try again. 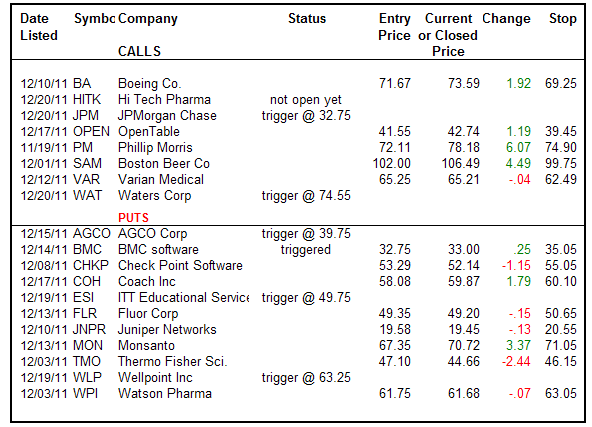 Buy calls tomorrow morning but only if both HITK and the S&P 500 open positive. We will adjust our stop loss down to $37.90. The most recent data listed short interest at more than 13% of the very small 10 million share float. Our target is $44.50. Readers might want to aim higher. The Point & Figure chart for HITK is bullish with a $58 target. 12/21 update: Shares of JPM were downgraded to "neutral" today but I doubt this had much impact on the stock. The rally seemed to stall. Shares spent the session moving sideways in the $32.00-32.40 zone. I don't see any changes from my prior comments. We are suggesting a trigger to open bullish positions at $32.75. We'll place our stop loss under Monday's low. More conservative traders might want to wait for JPM to breakout past technical resistance at its 100-dma instead (currently near $33.22). Our multi-week target is $37.50. 12/21 update: After yesterday's +12% surge OPEN gave up -4.5% on the news its executive chairman was resigning. We discussed last night that OPEN was trading down after hours on this news. Look for a dip or buy a bounce in the $42-40 zone. The most recent data listed short interest at 53% of the very small 16.2 million-share float. This can be a volatile stock. Our target is the simple 100-dma but we'll tentatively put our exit target at $48.50. We want to keep our position size small to limit our risk. 12/21 update: It was a strong day for PM. The stock broke out past resistance at $77.00 and surged to new all-time highs. Readers may want to take profits now. The newsletter's exit target is $79.75. We are raising our stop loss to $74.90. FYI: The Point & Figure chart for PM is bullish with a $95 target. 12/05 Call is up +100%, readers may want to exit now! 12/21 update: Shares of SAM hit the brakes today. The stock dipped to $104.74 this morning but recovering to almost unchanged on the session. I don't see any changes from my prior comments but more conservative traders might want to raise their stop loss toward the $102 area. Our exit target is $109.50. More aggressive traders may want to aim higher. FYI: The Point & Figure chart for SAM is bullish with a $117 target. NOTE: The most recent data listed short interest at 22% of SAM's extremely small 8.3 million-share float. That's definitely a recipe for a short squeeze. 12/21 update: VAR spent the session consolidating sideways near resistance at $65.00. The high today was $65.44. I am repeating my comments from yesterday. I'd prefer to see a move past $65.50 before initiating new positions. 12/21 update: There was no follow through on yesterday's bounce in WAT. Shares hit $74.43 this morning and fell to close down -0.5%. We're not giving up yet. We'll wait for WAT to show a little more strength. 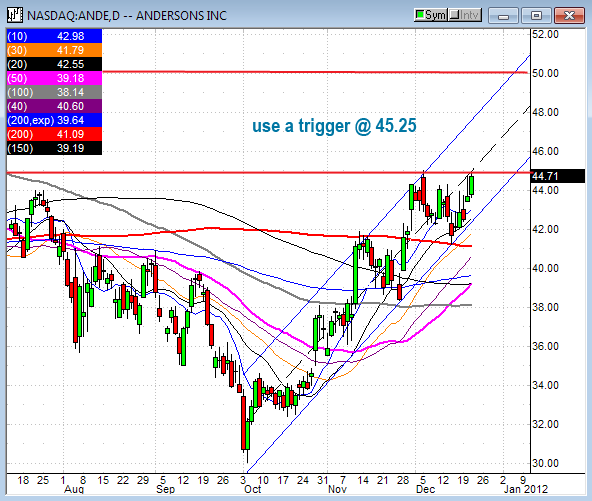 I am suggesting a trigger to buy calls at $74.55 with a stop loss at $70.75. Our target is $79.50. 12/21 update: There was no follow through on AGCO's bounce from Tuesday. There is still a chance shares might break down under support at $40.00. We'll tweak our entry point and move the trigger to buy puts down to $39.75. We'll adjust our stop loss to $42.55. If triggered at $39.75 we want to keep our position size small. 12/21 update: BMC almost completely erased yesterday's gains with a -4.0% plunge. This is probably a reaction to ORCL's disappointing earnings report last night. Shares of BMC did hit an intraday low of $32.71 and that's enough to trigger out put play (trigger was 32.75). If you're looking for an entry point I'd wait for a new relative low (under 32.70). 12/21 update: CHKP has erased yesterday's +3% bounce with a -4.5% drop today. This move in CHKP is also influenced by the disappointing results from Oracle (ORCL). CHKP did manage a small bounce off its lows near $51.15. Volume was heavy on today's decline. I am not suggesting new positions. There is potential support near $51.00 but we're aiming for the $48.00 level. More aggressive traders could aim lower. FYI: The Point & Figure chart for CHKP is bearish with a $46 target. 12/21 update: The oversold bounce in COH continues. Shares outperformed today with a +2.0% gain. Just as expected the stock rallied toward the next level of resistance near $60.00. The high today was $59.90. 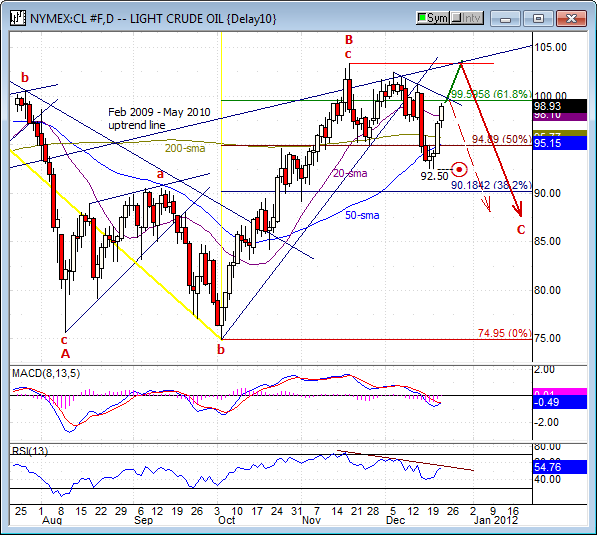 If the market is positive again tomorrow then COH will likely hit our stop loss at $60.10. Our multi-week target is the $51.00 level. FYI: The Point & Figure chart for COH is bearish with a $52 target but this could grow. 12/21 update: ESI is still trying to rebound and it's doing a good job of it today with a +1.7% gain. Shares stalled at short-term technical resistance near the simple 10-dma. Since we're still sitting on the sidelines here it doesn't hurt to wait and watch. 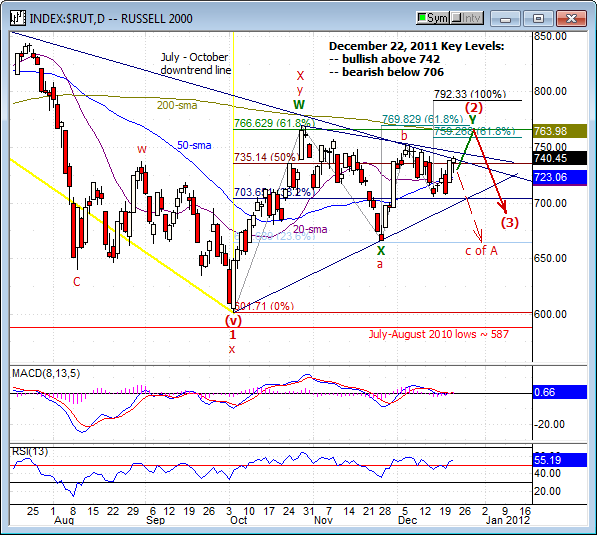 If the bounce continues tomorrow we will probably drop ESI as a bearish candidate. I am suggesting small bearish put positions if ESI hits $49.75. Why small positions? Because the most recent data listed short interest at 55% of the very small 17.9 million-share float. If ESI were to suddenly bounce the stock could shoot higher on a short squeeze. If triggered at $49.75 we'll aim for $45.25. The Point & Figure chart for ESI is bearish with a $44 target. 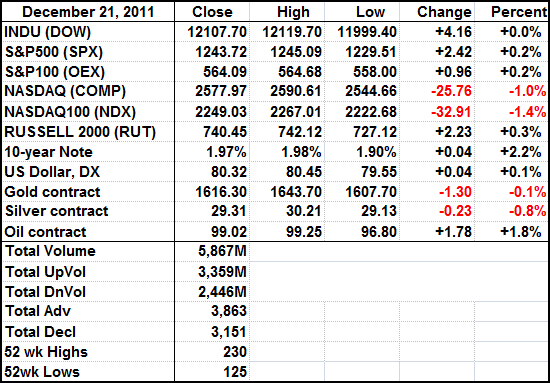 12/21 update: FLR underperformed the market with a minor bounce. I am not suggesting new positions at this time. More conservative traders may want to inch their stop loss closer to the $50.00 level. We want to keep our position size small because FLR is arguably already oversold but that doesn't mean it can't get more oversold. FYI: The Point & Figure chart for FLR is bearish with a $43 target. 12/21 update: Tech stocks underperformed today and JNPR was no exception. The stock lost -1.4% but that follows yesterday's +8.9% surge. I remain very cautious here. More conservative traders may want to exit early or tighten their stops closer to the $20.00 level. 12/21 update: MON tried to breakout past the $71.00 level this morning but failed twice. That doesn't mean it won't happen tomorrow if the market continues to move higher. We are not suggesting new positions at this time and more conservative traders may want to exit early now. Our target is $60.50. More conservative traders may want to exit near $63.00 instead. FYI: The Point & Figure chart for MON is bearish with a $60 target. 12/21 update: There was no follow through on TMO's bounce on Tuesday. Shares underperformed with a -0.6% decline today. I am not suggesting new positions at this time. More conservative traders might want to consider lowering their stop loss closer to the $45.00 level. Or you could exit now with the put option at breakeven. 12/21 update: WLP is still trying to bounce. If we see WLP close over $66.00 we'll drop it as a bearish candidate. Until then the plan is to buy puts when WLP hits $63.25. 12/21 update: WPI extended its bounce to two days in a row. Shares are nearing what should be short-term resistance near $62.00. The exponential 200-dma at $62.75 should also be overhead resistance. We're leaving our stop at $63.05. More conservative traders might want to adjust their stops lower in case the bounce continues. I'm not suggesting new positions at this time.